It is in the flow of existence 12:54 PM Sunday here in west Michigan. Outside this afternoon the sun is shining. Last night after Carol left for work I shut up the house and turned on the central air system. It is 72 degrees inside my cell right now. I do not remember what time I got up this morning. I do not remember either what time I went to bed last night. My brain is weary. But I did get up to face the first day of a new week. We are already entering the middle of the month this week. Soon August 2018 will be gone. I got up ate a bowl of cereal and messed with our main computer. After messing with our main computer I wrote in my paper diary and then dozed till my wife arrived home from work. This morning after my wife went to bed for the day I drove downtown to Reader's World Bookstore to get more Sunday newspapers and to look at their books. I bought one book along with three Sunday newspapers titled, 'Asymmetry' a novel by Lisa Halliday. Since getting home from Reader's World I have been reading the The New York Time Sunday Edition newspaper. Also have been reading, 'The Scarlet Tree' autobiography by Osbert Sitwell. 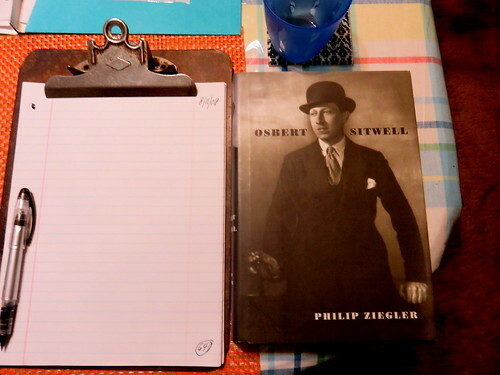 I do remember filming a video last night and reading late into the night from a book titled, 'Osbert Sitwell' a biography by Philip Ziegler. I also read yesterday, 'The Scarlet Tree' by Osbert Sitwell. I suppose I will close to brush my teeth and doze.